After talking with some colleagues at work who are really into photography, I went out and got the Canon 50mm f/1.8 lens - in the context of photography equipment, it's really cheap at about $80. So I've gone out shooting with the 50mm now and then, and took it to Midwest Bal Fest (Omaha, NE) in 2007. This time, I could take the f-stop way down. Turns out the Eagle's lodge is just really really dark. Honestly, this time, it did feel a little dim. And darned if my photos didn't wind up all dark and yellow. Also disturbing was that I also learned I don't hold the camera steady enough for the relatively long (1/30 sec, 1/60 sec - and later I would realize I should really try to get closer to 1/125 sec). I saw a lot of other photographers had great photos with flash, but it would take me until now (2009) to really try to use it. Exposure: 1/60 sec. Acceptable, but these days, I try to go a little faster, like 1/125 sec. Of course, I violate that all the time too. f-stop: f/1.8. This is extremely "fast." For low light indoors, I figured I should go as fast as possible. 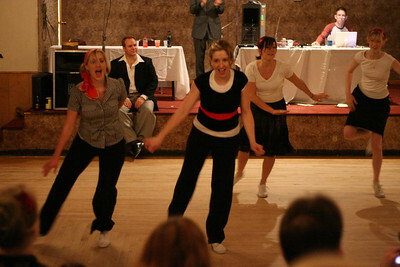 Ideally, f/4.0 would be nice, but I don't think I've been to any swing venue where I could do that. ISO: 3200 - a little grainy, but I was trying to get light any way I could. File format: Still mid resolution JPG. Big mistake! Use RAW! I've forgotten just how long it took me to learn that. It's still a bit yellow, and it's hard to adjust the white balance on a JPG.